You’ve written a new blog post and hit ‘publish’. What next? You may have subscribers who receive an email alert, either immediately or maybe in a weekly digest, together with other blogs they follow. But what about reaching new readers? Your post may well come up in searches – particularly if you’ve thought about your keywords and used them strategically. Blogs are part of the bigger social web, and the principal way they get found (and you get new readers) is via the sharing that happens on online social networks – not just directly from your blog, or on Twitter, Facebook, Google+ and so forth but also blogger communities, writers’ communities and special interest forums. But for sharing to take place, people have to know about your blog posts. What can you do to help kickstart the sharing process? The answer is as much or as little as you like. How it works: You log onto your social network(s), write an update and post in the URL to your blog post. Some people see it, click on it and hopefully share it to their networks. Upsides: doing it manually means you can write bespoke updates for each of your social networks, which may be desirable if you connect with different audiences and want to customise your language, or maybe not always post to a particular network. You will have a clear picture of what updates are being posted when and where, so you feel in control and happy that your audience won’t feel swamped with too much promo. Downsides: it’s labour-intensive, especially if you post often and are active on a number of networks or forums. Unless you consistently use a URL shortener/tracker like bit.ly, you won’t be able to easily track who’s clicking or sharing. When it comes to Twitter, one update probably won’t do it, because it’s unlikely all your followers will be online and monitoring their feed at that one moment. If you blog with WordPress, it’s fairly easy to connect your blog with your social networks so that whenever you publish a new post, an alert goes out. From your Dashboard, go to ‘Settings’- ‘Sharing’. Here’s the page for my blog Poetgal, and you can see I have connected it to my Twitter and Google+ accounts. If you click on ‘Edit’ you can customise the wording of the auto-update. 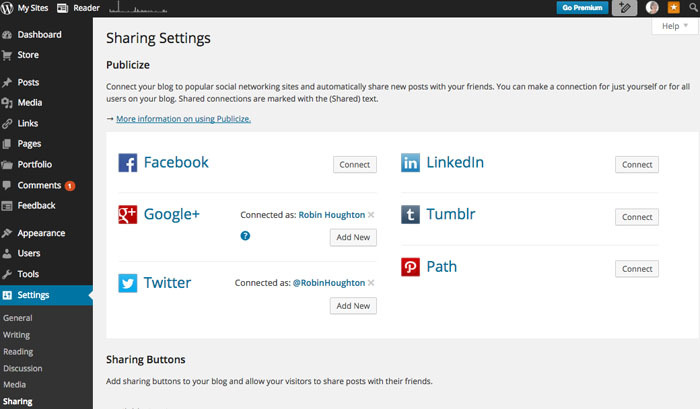 Then when you hit ‘Publish’ the update and link to your blog post will be posted to your connected networks. There’s a good walk-through of Publicize here. If you’re not using WordPress, don’t worry, there are third-party apps that do the same job no matter what blog platform you’re using, and some come with many more features (see below for the all-singing all-dancing options). For example, take a look at Twitterfeed or IFTTT (which stands for ‘If This Then That’). Upsides: You no longer have to go to your social networks and post each blog update, so it saves you a shedload of time, and having to think about it. Once these services are set up, they run in the background. 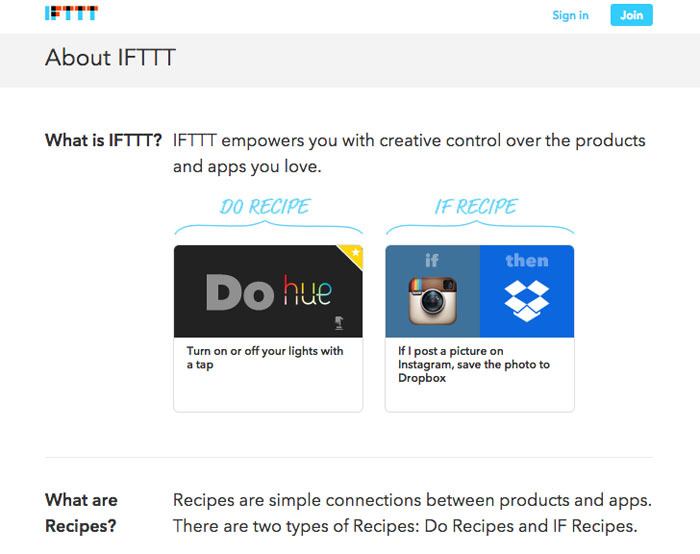 An app such as IFTTT allows for quite specific targeting, using what it calls ‘recipes’. This means you can specify things like “If I publish a new post on my WP blog with the category ‘Twitter’ then post a tweet with image to @robinhoughton”. 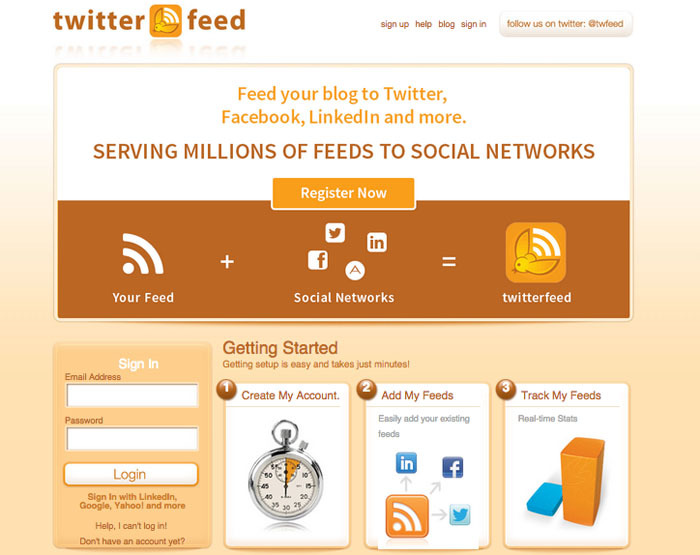 You can also set up automatic actions based on just about any activity on most social platforms. Downsides: You may not want every update to go out on all your social networks, and if that’s the case you need to set up filters – always check what settings are available. These tools are pretty cool but there are so many of them it can feel overwhelming – it’s very easy to sign up for them as the basic versions are all free, but you need to keep a clear picture of what you’ve set up, otherwise you could end up multiple-posting. I’d advise finding a service you like and sticking with that. If you change any of your network passwords you’ll need to refresh the connections with any third party apps as they will stop running. One of the main issues with basic, one-off auto posting is that it only happens once. So you have the same problem as manual posting in that not everyone will see your autopost. If this concerns you then you probably should choose an app that autoposts as many times as you like, at different times of day, what I would call managed automation. A step further from basic automation is to signup for a service that will allow you to manage a range of triggered actions based on your specifications. You can decide exactly what gets posted, where and when, and you usually have access to a whole range of other features such as browser extension allowing you to bookmark and share anything on the web, syndication of your blog posts to social bookmarking and media sites, and social analytics. The good news is you don’t have to jump into using all the available features, and in fact the advanced features are usually only part of the premium (paid for) packages. Even so, the free versions of Hootsuite, Buffer and dlvr.it, for example, are all very good and worth checking out. You can sign up with any of these services using your favourite social network (if you wish) or by creating a new username for that app. The free versions will have limits on how many social networks you can connect, access to analytics and custom features. But unless you are a pro blogger (running your blog as a business) then you’ll probably find the free services are plenty good enough. All these apps allow you to ‘queue’ your updates for re-posting across your networks at different times of day and on different days, in order to be seen by a bigger cross-section of your followers. Upsides: These apps give more power to your social updates and take a lot of the elbow-grease out of it. Pro-bloggers swear by automation and there’s no doubt that if you are serious about making blogging pay, you need to spend less time doing things that can be automated, and more time on the stuff that requires brain-effort such as writing great blogs posts, interpreting your stats and nurturing strategic relationships. Downsides: There will be some trial and error before you find the app(s) that suit you, and you need to pay attention to the setup. Automation isn’t for everyone: many people prefer slow-blogging: creating contacts more organically and growing a following based on recommendation and more personal promotional methods. That’s absolutely fine and if I’m honest I’m a bit of a slow-blogger myself. Having said that I do find Hootsuite invaluable as it gives me the right amount of automation and control while still keeping it real. There’s a great deal of commercial clutter and over-promotion on the social web, and bombarding it with yet more isn’t on everyone’s agenda. However, you do want people to see your blog posts, and saving some of your precious time by taking advantage of the helpful tools available is, I think, a sensible choice.